Stone is the most fundamental material but over the last 50 years its creative use has declined in the public realm. Through a Winston Churchill Memorial Trust Fellowship David F. Wilson aimed to discover how other creatives are exploring the space between tradition & current practice, travelling in the USA & Canada through the summer months of 2017. Where problems exist, new opportunities open up. 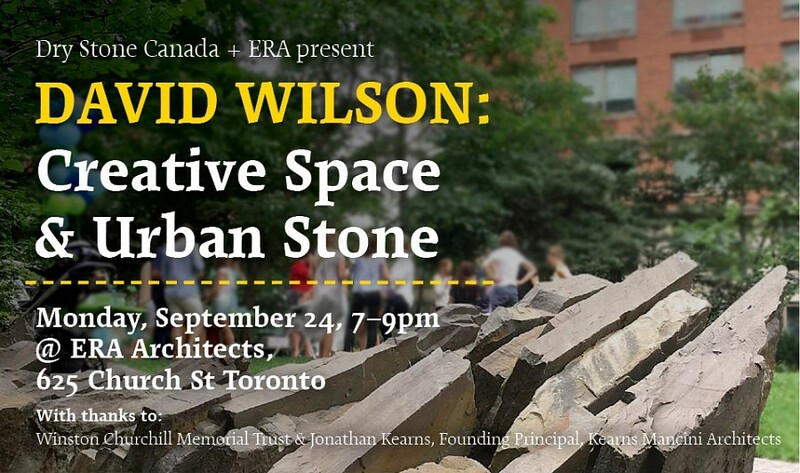 Using photos and examples, David’s talk will explore the findings of his North American tour, the challenges posed to creative stone craft through modern building practice, and innovative ways to keep stone craft alive in urban spaces. Through the lens of his landscape architecture practice and university teaching, Brendan Stewart will respond to the report and extend the conversation, relating these findings, challenges and opportunities to urban spaces in Toronto and Canada. A public talk by David F Wilson (UK) in conversation with Brendan Stewart (University of Guelph), co-hosted with the Dry Stone Walling Association of Canada (Dry Stone Canada). David graduated in 1987 from Duncan of Jordanstone, Dundee, with a Masters in Public Art & Design. Following a college art degree, he was inspired by a new trend for artists to work outside the traditional gallery system and decided to pursue a creative career in art for a wider public. Flexibility has always been an asset in David’s practice when creating works in a public space. Every client & every different situation requires a unique design solution. Combining creativity with a playfulness of technique and form has always been at the heart of his process. Two public projects that display this aspect well are the Edinburgh Airport Interchange and Livingston Landmarks. The latter was awarded the coveted Pinnacle Award from the Dry Stone Walling Association of Great Britain. Brendan Stewart received his BLA from Guelph, attended Edinburgh College of Art, and received an MLA from the University of California, Berkeley. Brendan’s research focuses on heritage conservation planning and design processes, cultural landscape theory, design history, service learning and participatory design practices. Throughout his more than a decade of practice experience, Brendan has been actively engaged in the academic, professional, and community spheres. He has been a regular guest lecturer, critic, and instructor at the University of Toronto, Ryerson University, and the University of Waterloo, and was an editorial board member of Ground Magazine, the journal of the OALA. In 2015, he was involved in organizing and participating in the ‘Leading with Landscape’ conference in Toronto, hosted by the Washington DC based Cultural Landscape Foundation, which was attended by over 400 landscape practitioners and scholars from around the world. He is a director of the Friends of Allan Gardens a not for profit organization with a mission to revitalize one of Toronto’s earliest designed landscapes. Starting in 2017, Brendan is the University of Guelph’s appointed educator to the Ontario Association of Landscape Architects governing council. 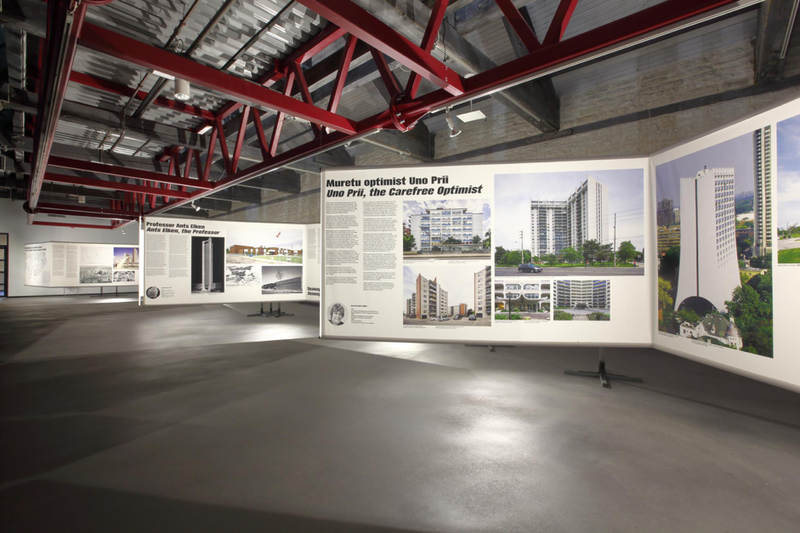 Toronto in Estonian: Section of exhibition at the Museum of Estonian Architecture. 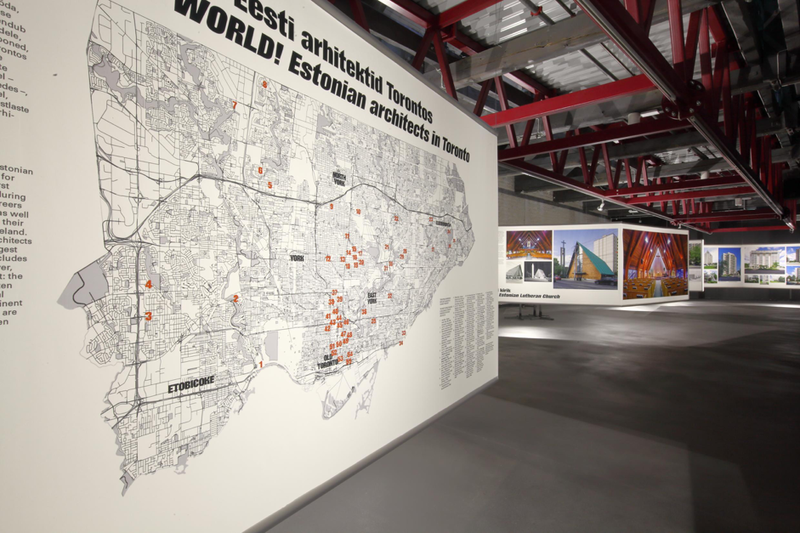 This spring, the exhibition To The New World: Estonian Architects in Toronto launched at the Museum of Estonian Architecture (http://www.arhitektuurimuuseum.ee/en/). Following a smaller exhibition and symposium last fall hosted by Toronto’s Tartu College, the show explores the strong Estonian link in the creation of Toronto’s particular branch of modernism. Exhibition and Symposium in fall of 2017 at Toronto’s Tartu College with ERA’s Graeme Stewart as presenter. These exhibitions, and forthcoming book, are a result of years of research by Tallinn Architecture Centre archivist Jarmo Kauge. Following with curiosity the rise in cult status of Estonian-Canadian Uno Prii, whose large cannon of whimsically optimistic modernism have become local icons (and protected heritage properties), Jarmo began to explore the link between Estonian trained architects and the building of modern Toronto. 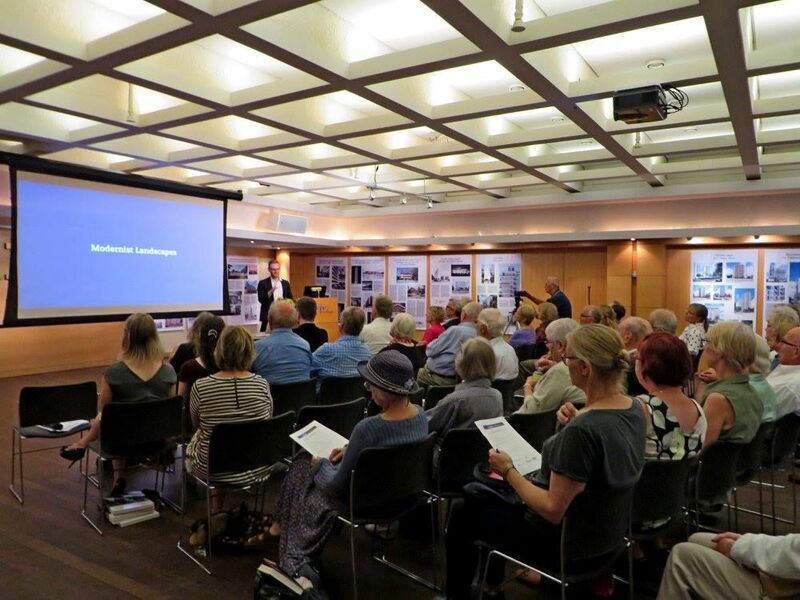 Through a series of study tours, he quickly realized that the connection went well beyond Prii and that an entire generation of Estonian emigres practiced, taught, and transformed Toronto. The opening of the exhibition at the Museum of Estonian Architecture represents a milestone for the international exposure of modernism in Toronto as well as the transatlantic scholarship that affected architectural and planning practice in post-war Toronto. ERA is proud to have been a collaborator in these efforts and congratulates Jarmo for the tremendous work in making it a reality. 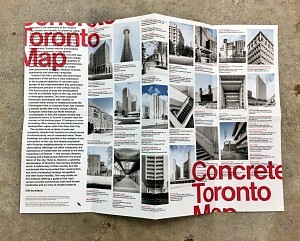 (ERA / Coach House) and the Concrete Toronto Map https://bluecrowmedia.com/collections/architecture-maps/products/concrete-toronto-map (ERA / Bluecrow Media). Also see an article by the Globe & Mail’s Dave LeBlanc published during the Toronto launch of the exhibition last fall. 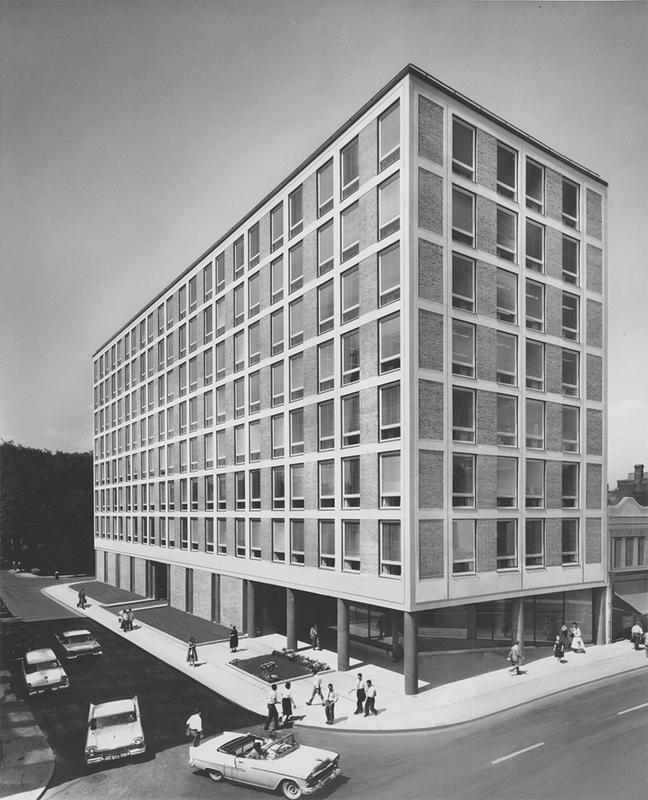 For two decades, we have called 10 St Mary Street our home, an eight storey modernist office building (1957) designed by the architects Mathers and Haldenby, whose offices were located on the 8th floor of the building. It seems fitting today as we say goodbye and start a new chapter in ERA’s story, that we’d share some of the history of this place that’s grown along with us all these years. The ground floor suite of 10 St. Mary Street, which faces both Yonge and St. Mary streets, was originally conceived as a retail space with a strong relationship to the public realm. Until recently, this suite has been occupied by a chain of fast food restaurants. The open volume at the base of the building has been partially enclosed as a restaurant terrace. The Site sits on land originally owned by the Buchanan and Elmsley families in the early 19th century. In 1848 Captain John Elmsley donated part of his land to St. Michael’s College and St. Basil’s Church and began subdividing the property, naming local streets after his favourite saints. Many of the buildings that presently occupy the block bounded by Yonge, St. Mary, St. Nicholas and Charles streets were constructed during the latter half of the 19th and early 20th centuries, following the extension of Charles Street (formerly Czar Street) westward from Yonge Street in the 1880s. As Yonge Street developed as a commercial strip, cross streets were often developed with row houses. The length of the block along Charles Street West up to the westward addition to 720 Yonge Street is occupied by a row of residential buildings constructed in 1891. The Yonge Street properties (with the exception of the mid-century building at 10 St. Mary Street) represent the second generation of storefronts along the Yonge Street corridor, which was revitalized with increased commercial activity at the turn of the last century. These were constructed in 1909 as a parade of shops with similar detailing; The mid-block shopfront properties at 710-718 Yonge Street first appear on Fire Insurance Plans in 1912. The portion of the Site at the corner of St. Mary and St. Nicholas Streets was originally residential, but primary source documents show automotive uses began in the early 20th century and continued until the 1940s. In the 1920s the Holden Vulcanizing Works and Johnson Motors Repair operated at 79 St. Nicholas Street. The Uptown Auto Body and Fender Repair Co. were replaced in the 1940s by General Auto Body and later Pep Boys Garage. Coles Bookstore purchased the Barron properties in the 1940s, using the Yonge Street storefront for retail and the former stables on St. Nicholas for storage. The fine-grained Victorian buildings along the southern portion of the block were replaced in 1957 by the 8-storey office building at 10 St. Mary Street, designed by Mathers & Haldenby. In the latter half of the 20th century, the properties on St. Nicholas Street witnessed a string of tenants and a wide variety of uses, including furniture stores, art galleries, restaurants and discotheques. Our office will be closed on Friday, June 15, while we pack up and head just down the street to 625 Church Street, and we’ll be back to regular business on Monday, June 18. Late last month, on Thursday April 26th, the Toronto Chapter of the Canadian Green Building Council met for their annual Spring Open event. 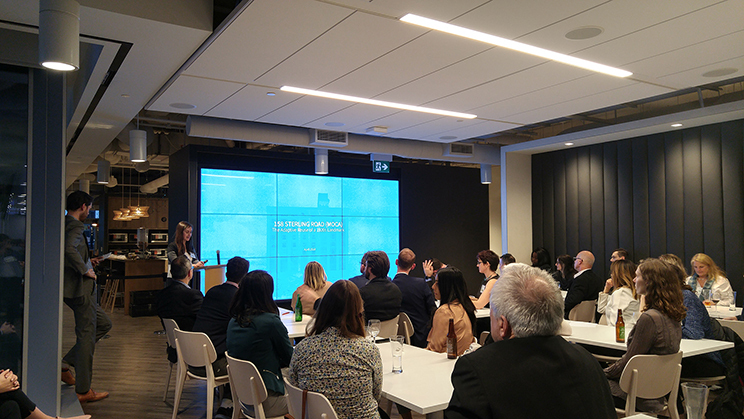 Hosted at the newly opened EY Tower downtown, the event included a series of rapid and informative presentations known as the event’s “Building Blitz” —highlighting the newest and most sustainable buildings in Southern Ontario. 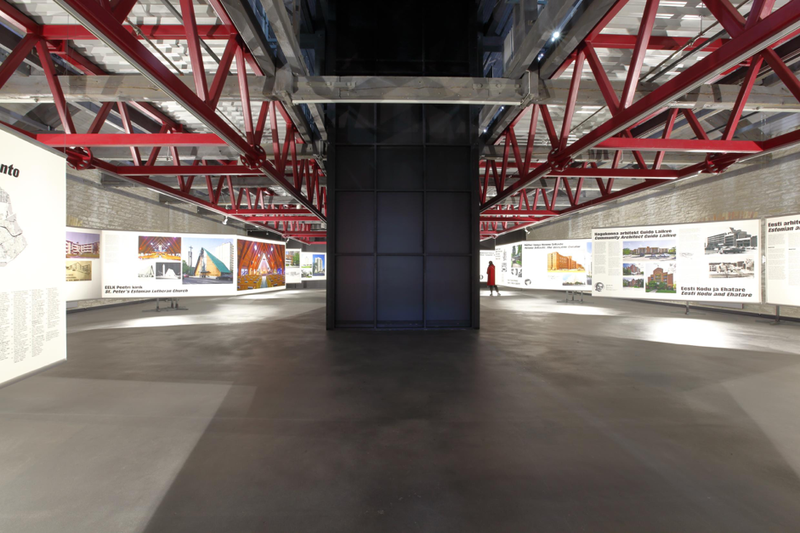 ERA’s Shelley Ludman was invited to speak about the adaptive reuse of 158 Sterling Road, the new home of Toronto’s Museum of Contemporary Art (MOCA). We were honoured to present on the often overlooked importance of adaptive reuse as a strategy for a sustainable future. University of Toronto – The Centre for Engineering Innovation & Entrepreneurship, Presented by Montgomery Sisam Architects Inc. This month ERA Principal Graeme Stewart joined federal, provincial and municipal leaders at the launch of the first round of National Housing Strategy programs, kicking off a new era for housing in Canada. As a major step in catalyzing Tower Renewal, the National Housing Co-Investment Fund’s ‘Repair and Renewal’ stream targets the repair of 240,000 units, with $2.26 billion in capital contributions and $3.46 billion in low-cost, long-term loans. This stream will help to catalyze Tower Renewal across the country, benefiting Canadians living in both public and privately-owned housing. These programs represent significant investments toward the preservation of existing housing, reduction of greenhouse gas emissions through retrofits, and the crucial maintenance of this stock’s affordability and ongoing social sustainability. The Tower Renewal Partnership, a collaborative led by the Centre for Urban Growth and Renewal, welcomes these new programs and their potential to catalyse major shifts nation-wide toward the renewal of Canada’s aging housing stock. In the coming months, the TRP will continue to work with a broad cross-section of stakeholders — including residents, owners, industry, nonprofits, and governments — to demonstrate the potential of renewal projects to lead the way in envisioning healthy, secure, and affordable housing for all Canadians. 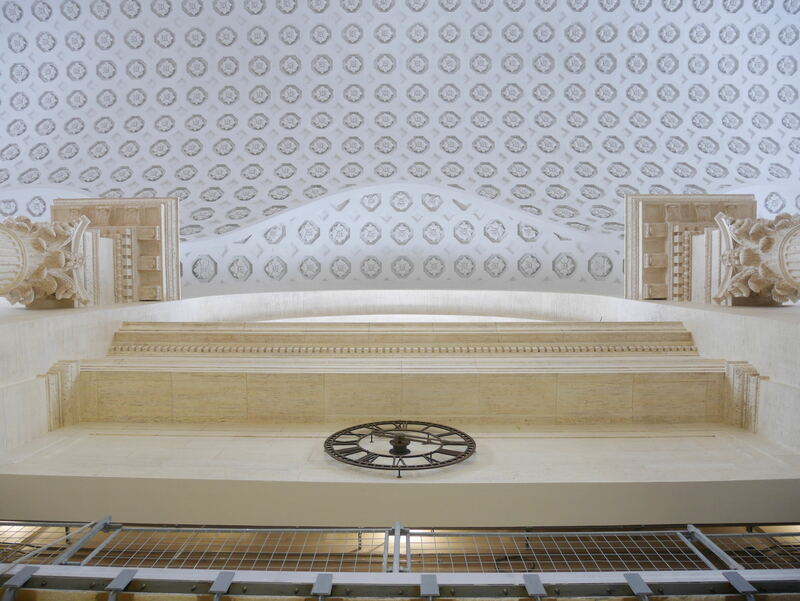 The heritage interiors and finishes are coming to life at the Government Conference Centre (GCC) in Ottawa. Since the new year, the scaffolding has come down in the General Waiting Room (GWR, as shown here), revealing the rehabilitated suspended ceiling in its entirety and the recently painted imitation travertine wall finishes. The GWR is an elaborate and significant interior space, part of the formal processional route bringing visitors through the building to some of its grandest interiors. 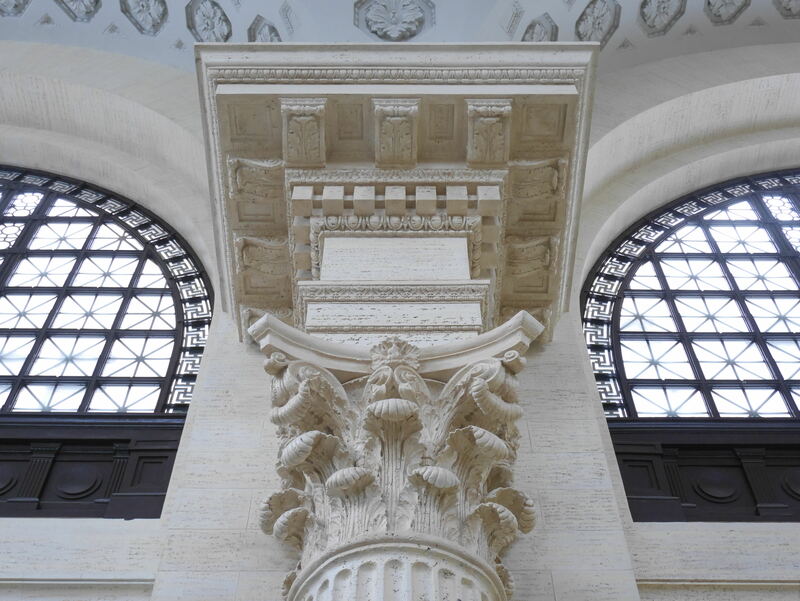 As a visitor enters through the Rideau Entrance Lobby, down the grand stair, they find themselves here: viewing the building’s Beaux-Arts features evident in its monumental use of classical forms such as the columns, entablatures, pilasters, arches and vaults. 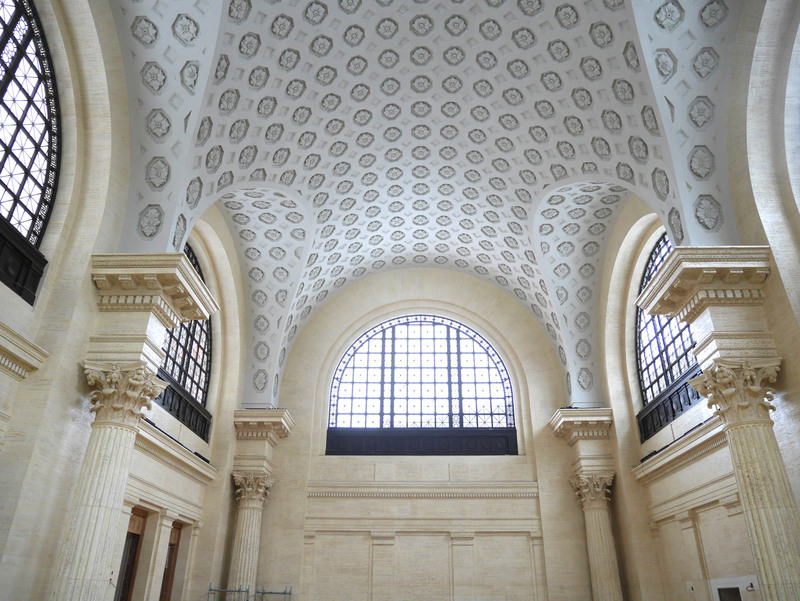 The GCC Rehabilitation Project is transforming the former Ottawa Union Station into an Interim Senate Facility for ten years, after which it will revert back to its role as the GCC. The rehabilitation aims to reveal the historical elements of the building that were concealed over time, such as its theatrical qualities and rich palette of materials. ERA Architects is working as the heritage architects with Diamond Schmitt/KWC Architects in Joint Venture. As ERA continues to grow and evolve, ERA’s executive and associate team is thrilled to announce the appointment of seven new associates: Alexis Cohen, Dan Eylon, Samantha Irvine, Shelley Ludman, Jordan Molnar, Annie Pelletier, and Janice Quieta. We’re very pleased to recognize the leadership of these new associates and their commitment to ERA’s core values. We also appreciate the energy they bring to their work, their individual perspectives on city-building and cultural planning, and the professional expertise they offer our clients and their colleagues at ERA. Alexis Cohen is trained as an architectural historian and brings her research background to a range of heritage planning projects at ERA. She works collaboratively with complex project teams using historical research and analysis to inform the conservation of evolving urban environments. Annie Pelletier possesses nearly a decade of work experience on projects between New York and Toronto, managing project types from residential to institutional, on a mixture of new-build, adaptive re-use, extensions and conservation work. Dan Eylon collaborates with differing levels of government, engaging in a broad range of conservation and planning projects. He is driven to make a meaningful contribution to the quality of urban development and heritage resource management. Janice Quieta has studied and worked in Toronto, Halifax, Dusseldorf, and Koln and participated in a number of national and international design competitions in Canada and Germany. She is interested in sustainable technology at the intersection of new and existing materials. Jordan Molnar’s project experience is both broad and deep, including heritage conservation, adaptive-reuse, and renovations/additions. He compliments his architecture portfolio with interests in small community development through Culture of Outports and Small, participating in community feasibility studies, community workshops and design-build projects. Samantha Irvine oversees projects that impact culturally significant buildings, neighbourhoods and landscapes. She is committed to creating opportunities for historic buildings to enrich urban life. Her perspective is informed by the uncommon combination of a legal background and experience in both heritage conservation and community planning. Shelley Ludman has been involved in significant conservation and adaptive re-use projects within the cities of Montreal and Toronto, including additions to existing heritage designated properties, drawing inspiration from existing buildings and their surrounding context. 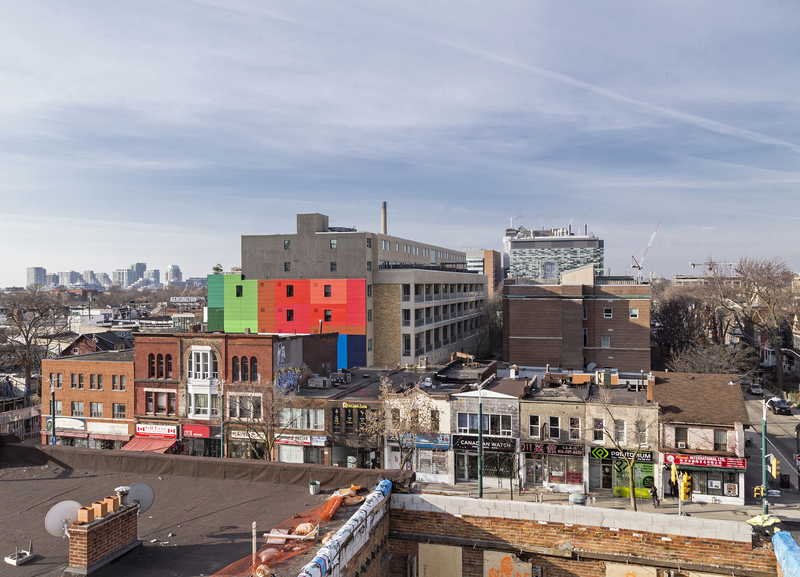 The scaffolding has finally come down to reveal the brilliant collection of 17 colours featured on the east façade of the Kensington Market Lofts building, a public art piece created by notable local artist and area resident An Te Lui! Inspired by the culturally-diverse public realm in which it is located, it as a gateway to the neighbourhood. Located at 160 Baldwin Street, the Kensington Market Lofts was built in 1952 by George Brown College to house their technical school, was and attached to an older red brick school building dating from 1923. The new addition was clad in glazed yellow terra-cotta blocks, which over time had begun to allow water to infiltrate its steel support structure. 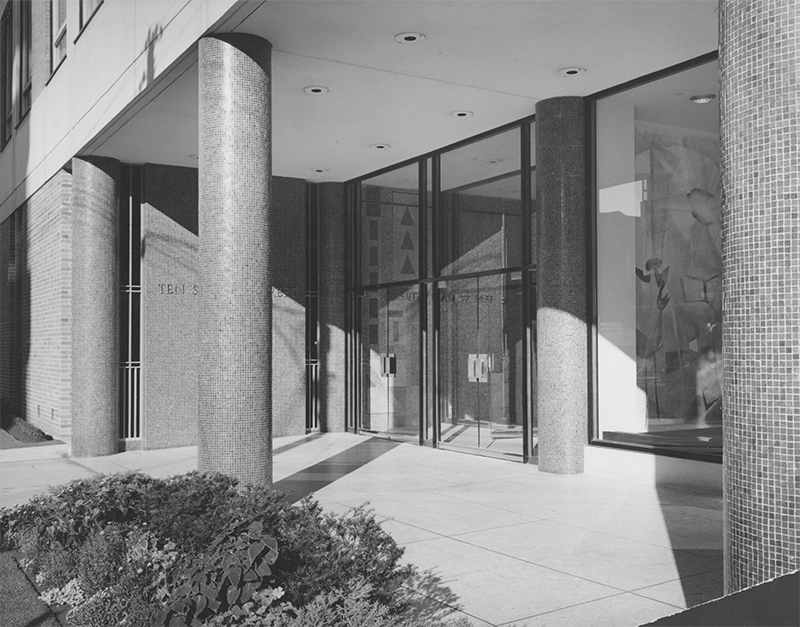 ERA has worked with the condo board on a long-term multi-stage revitalization of the buildings, including interior finish upgrades and wayfinding, as well as developing an extensive program of façade remediation. 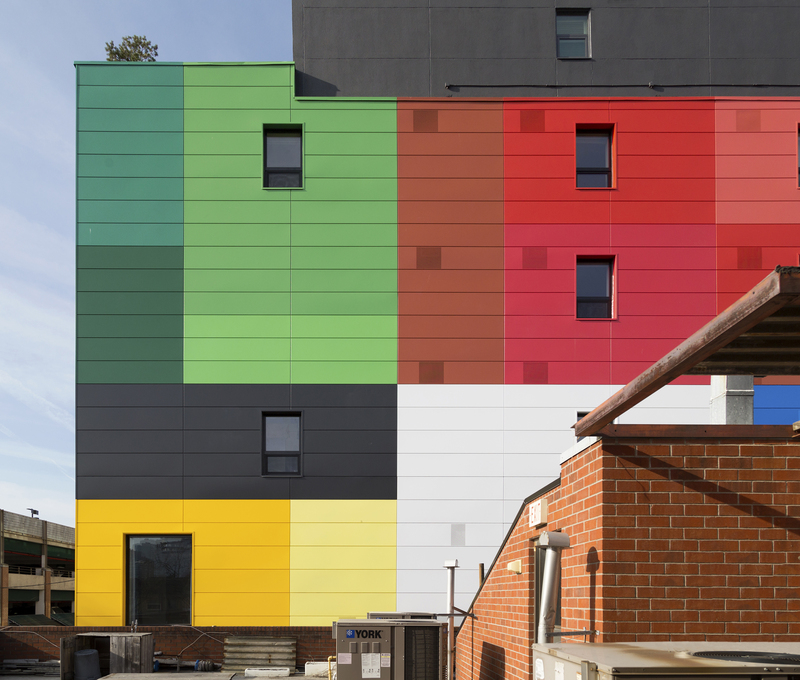 It was determined that the east façade was at particular risk of future infiltration, and that a robust over cladding strategy would be required to protect the steel structure once remediated. Simultaneously the remaining terracotta blocks could be salvaged for use in preserving the original features of the building on the remaining facades. 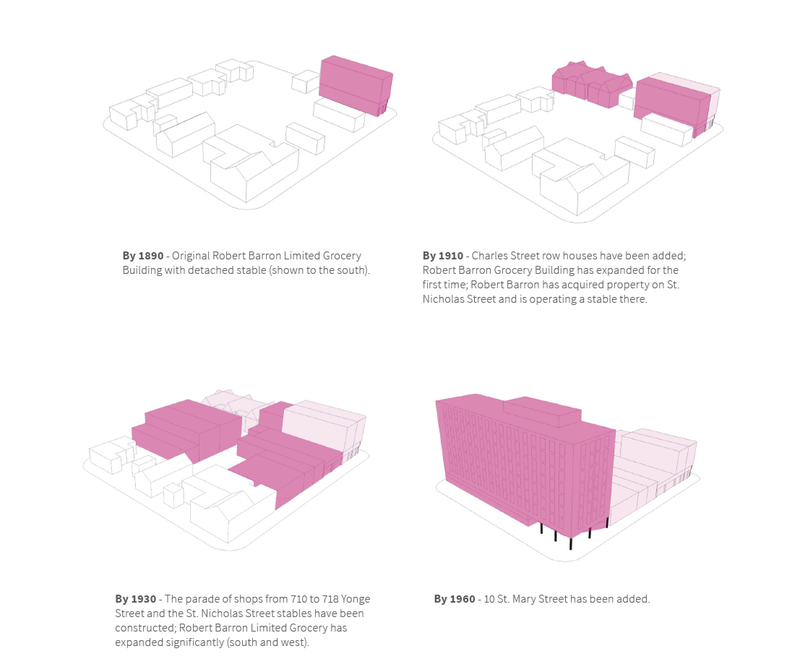 In addition to its functional necessity, ERA and the condo board viewed the proposed over cladding as a unique opportunity for the building to contribute to the public realm, and asked An Te Liu to develop a pattern that could speak to the building’s important context within Kensington Market. An Te Liu’s concept for the colour configuration was based a pattern depicting the neighbourhood’s historic diversity, the distribution of the colours being drawn from an analysis of the percentage of those present in the world’s national flags. The significance of the approach is that the material sits comfortably within its bohemian context as it complements the existing vibrant-coloured awnings, shops and graffiti that energize the streetscape. The project faces one of Toronto’s most important thoroughfares, providing a landmark that will invite people into the market at one of its primary entrances. It is a physical manifestation and embodiment of the eclectic spirit and energy of the market. Congratulations to ERA’s project team: Graeme Stewart, Max Berg, and Leah Gibling! To access recent CODAmagazine coverage on this project, click here. Images by An Te Liu and Vik Pahwa. 1. Announcement of $15.9B Co-Investment Fund, committing to the rehabilitation of 240,000 units of existing affordable housing as part of Canada’s landmark National Housing Strategy. 2. 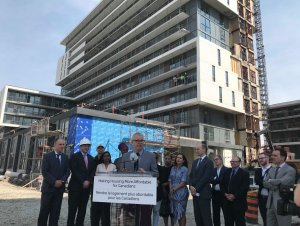 $350M allocated towards apartment retrofit through Ontario’s Social Housing Apartment Retrofit Program (SHARP) and Social Housing Apartment Improvement Program (SHAIP) with the first round of projects underway. 3. Release of Transform TO, a strategy adopted by Toronto City Council that will require every multi-unit residential building (MURB) to undergo deep energy retrofit by 2050. 4. Intermunicipal Working Group convened with representatives from Ontario’s four largest cities: Toronto, Hamilton, Mississauga and Ottawa working toward a collaborative Tower Renewal framework. 5. Provincial collaboration toward Tower Renewal action. 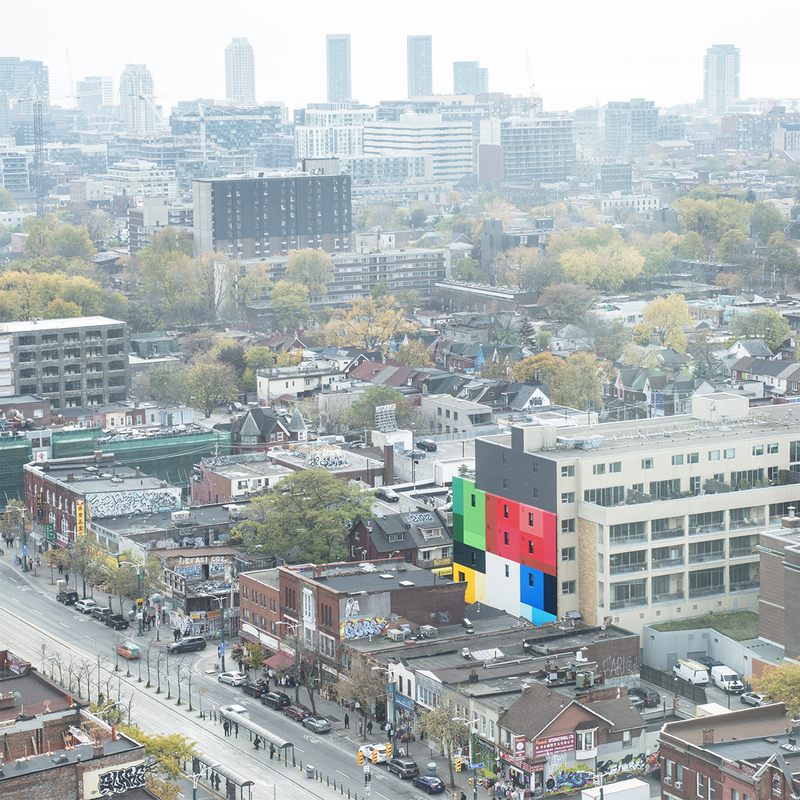 Initiated in 2017, five provincial ministries are coordinating to tackle the question of enabling Tower Renewal in Ontario through housing rehabilitation and neighbourhood growth planning. 6. The Tower Renewal Action Forum brought together international experts and local city-builders to explore innovative strategies for transitioning aging tower neighbourhoods to meet the demands of our 21st century cities with welcome remarks from Mayor of Toronto, John Tory and the Minister of Housing, Peter Milczyn. 7. 500 tower sites in the City of Toronto rezoned through the launch of the RAC Zone, removing barriers to Complete Community objectives being met on tower sites. CUG+R, the Tower and Neighbourhood Revitalization Unit, United Way Toronto and York Region, and Toronto Public Health won the 2017 OPPI Excellence in Planning Award for the implementation of this work. 8. New primary research underway towards a comprehensive Tower Renewal framework: Retrofit Finance Analysis for a nation-wide retrofit program prepared by the Tower Renewal Partnership and the National Housing Collaborative, and a study on Housing Quality and Standards prepared by CUG+R and Transsolar in partnership with Maytree identifying standards to ensure healthy, safe, and resilient retrofits. 9. University Research Network established, harnessing applied graduate student research on Tower Renewal at five academic institutions across Ontario. 10. Unit Retrofit Challenge initiated, creating a prototype to engage owners and industry in research, development, monitoring, and verification of local best practices on a single-unit basis. In 2018, work continues by a diverse set of partners to continue to enable Tower Renewal and the Tower Renewal Partnership continues to be a catalyst for this progress through ongoing research, policy advocacy, and action.